We’ve been successfully keeping a secret for quite some time. It is time, however, to come clean. Loyal blog readers already know that our team can make custom curtains to exact specifications with regard to fabrics, colors, and sizes. 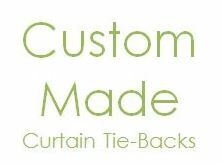 What many people do not know, until now, is that we can also make custom curtain tie-backs. We know, it’s shocking – take a minute if you need it, and when you’re ready, read on. Curtain tie-backs can provide a finished look to your curtain design and are imminently useful in many situations. They create an elegant silhouette in any room, are often used on kitchen windows, and are especially effective on floor-to-ceiling curtains. They allow you to open up a room while still being able to show off your curtains.